The USS Indianapolis gets a solid mention in Bomb as it was the ship that delivered the components of the atomic bombs to the Enola Gay to be dropped on Hiroshima and Nagasaki. In the book about the atomic bomb, the fate of the Indianapolis then merits just a passing aside. But my god, what a fate! After dropping off the bombs, it headed out for its next port, and was torpedoed by a Japanese sub and sank. Due to a terrible policy, some poor handling of various messages, fear of Japanese fake messages to lure Allies into traps, and so on, the sailors and marine who survived the initial two torpedoes and explosions, who didn't die right away but instead managed to find a life jacket or life boat and get away, then had to endure nearly 5 days at sea, without food or water or shelter, most just in the water not in a life raft, and of course, surrounded by sharks. When they were finally spotted--by accident as still no one was looking for them!--a fraction of the men who had survived the first day were still alive. Boy, this book had a forward propulsion like few I've read. For a nonfiction, history book, it read so fast, and was absolutely unputdownable. It wasn't a short book but I read it in two days. In the end, I think the navy made a lot more mistakes and errors than they ever took responsibility for, and seriously mislaid the blame. 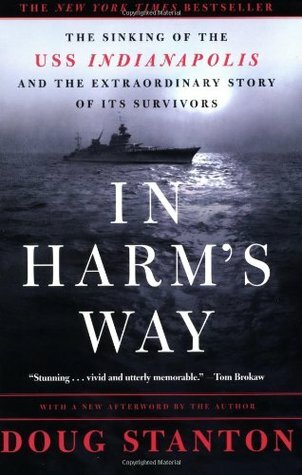 The author also takes a half dozen men (who obviously survived as he'd obviously been able to talk to them) and uses their experiences--in different groups, in different levels of injury and danger--to demonstrate the situation for all the men, and to humanize the tale in a very effective way. This is a top-notch work of history about an often overlooked (the news of the sinking finally broke the same day Japan admitted defeat so it was inevitably lost in the brouhaha) but horrifying and gut-wrenching part of history. These men made the end of the war possible, and then were forgotten as their own lives were imperiled.